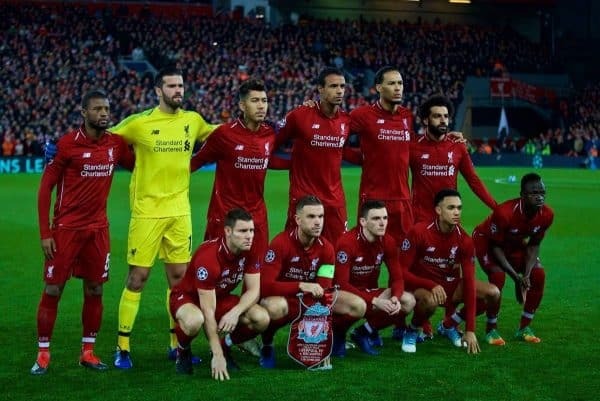 The Liverpool squad hailed Alisson, Mohamed Salah and the Anfield crowd after a 1-0 win over Napoli clinched a place in the Champions League‘s last 16. The Reds went into Tuesday night’s clash knowing either a 1-0 victory or one by at least two clear goals would guarantee progress to the next stage. Jurgen Klopp‘s side dominated the game, but it came down to two key moments at either end of the pitch, with Salah’s brilliant strike and Alisson‘s last-minute save defining 90 minutes otherwise hallmarked by wasteful finishing. Liverpool can now look forward to Monday morning’s last-16 draw, although there’s the small matter of the visit of Man United to come before then. “It was always going to be a tough game, they’re a good team. “We know Anfield’s about European nights. The crowd were amazing tonight. “I thought it was a really good performance, we knew defensively that was what was going to win us the game. We had to be on the front-foot. “The first game I don’t think they experienced how we can defend at all, it was a really poor performance. Unsurprisingly, much of the focus after the game was on both Alisson and Salah, who have proved to be game-changers on a number of occasions already this season. “When we’re 1-0 up they’ve got nothing to lose, and they throw their centre-back up and we knew that was going to be the last 10 minutes. 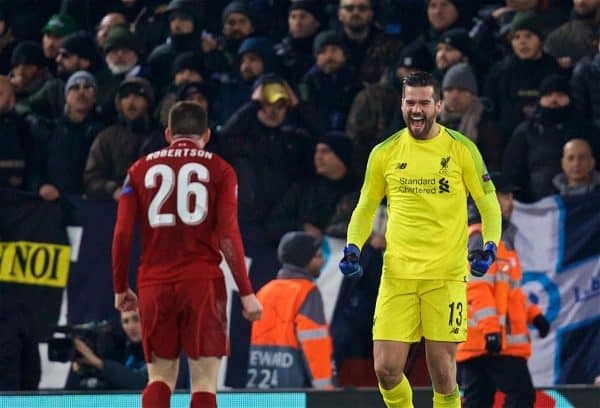 “We had to say strong—and big Alisson, it’s an unbelievable save that he’s just pulled off and all the credit goes to him. “[It was] an unbelievable save from Ally. I think it was a fantastic performance all the way through. “And Mo’s goal as well. He’s a match-winner, he’s a top-class, world-class player. For Virgil van Dijk, who spoke to LFCTV, the overall impact of Alisson‘s arrival is clear, with the pair working closely together at the back. “He’s been fantastic for Liverpool and for us. “[He’s a] great character, a great guy and he helps us all. He gives confidence to everyone. “That’s how it is and how it should be as well, for the whole team. “That Ally needs to make the fantastic save is something that wasn’t really necessary if we’d scored all the goals—including myself. Another special night at Anfield! Atmosphere was amazing and performance was there to match it. Onto the round of 16! ?? @alissonbecker I love you ?? What a night at Anfield! Only Anfield can do this! Well done boys. Everything was perfect till the moment when I heard my name and the words “doping control” ?? Into the next round @championsleague !?? Obrigado @alissonbecker ?? Liverpool will now need to turn things around quickly, as just five days after this crucial night at Anfield they take on United knowing a win will keep them top of the league. The euphoria of this important victory will give them a boost as they aim to do so, but Klopp will be hoping for a more comfortable afternoon, and that he will need less from Alisson this time out.